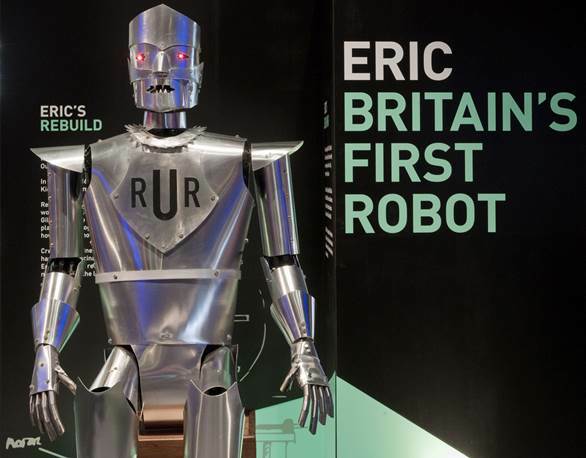 20 October – Today the Science Museum unveiled a 2m tall, full-size working replica of Eric, one of the world’s first robots. Eric will be on display from 20 October to 30 November 2016, and will be demonstrated twice a week while on show at the Museum. Eric holds a unique place in our history. Built less than a decade after the word robot was first used, he was everything we now imagine a robot to be – a talking, moving mechanical person. Originally built in 1928 by Captain W.H. Richards & A.H. Reffell, Eric amazed crowds across the UK, Europe and the US, before he mysteriously disappeared. In June 2016, the Science Museum launched a Kickstarter campaign to bring Eric back to life to star in a forthcoming major exhibition, Robots. Thanks to the generosity of 861 backers, the Kickstarter campaign raised over £50,000 allowing the Museum to bring Eric and a second robot, Inhka, back to life. Working with artist and robot builder Giles Walker, the team has recreated Eric, keeping his appearance as close to the original as possible. More details of the build process can be seen in this short video and this blog post from curator Ben Russell. Now part of the Museum’s permanent collection, Eric will star in the forthcoming Robots exhibition from February 2017. Support from Kickstarter backers will also enable Eric to travel the world as part of the exhibition’s international tour from 2018. While on display in the Museum, Eric will perform short demonstrations each week on Wednesdays and Thursdays at 12.15. Eric will be on static display at all other times. For further information visit sciencemuseum.org.uk/eric.